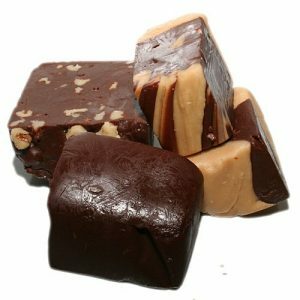 Our fudge is homemade with carefully selected natural ingredients including fresh cream and decadent chocolate. It is dense and intensely flavored yet not too sweet. You will want to taste it to believe it. Our fudge is homemade with carefully selected natural ingredients including fresh cream and decadent chocolate. It is dense and intensely flavored yet not too sweet. You will want to taste it to believe it. 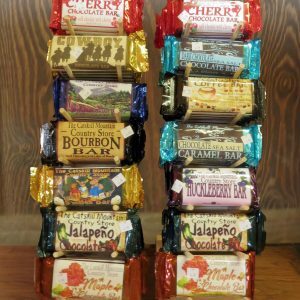 Flavors include: Chocolate, Dark Chocolate, Chocolate Walnut, Chocolate Peanut Butter, Mint Chocolate Chip, Tiger Butter, Maple, Maple Walnut, Orange Cream, Raspberry Cream, Rocky Road, Chewy Praline, Sea Salt Caramel Chocolate, Salted Nut Roll, Pumpkin Pecan, Vanilla.